Here in the US, there’s no denying that the LG Nitro HD is by far the newest thing to show up and flex its muscles for everyone to see – thanks to its speedy 4G LTE connectivity, 4.5” 720p True HD AH-IPS display, and 1.5GHz dual-core Qualcomm processor. With the latter, it’s expected to bring plenty of speed to the handset’s processing power, but as always, we’re curious right away to see how it handles with the barrage of usual benchmark tests. Before getting down and dirty with the benchmark tests, we do notice the smartphone exhibiting some evidence of sluggishness while simply navigating its homescreen with a static wallpaper. Well, it’s not terrible to the point unusable, but clearly visible enough to catch our eyes – versus the smooth tendencies of the Samsung Galaxy S II line. As far as other basic tasks are concerned, like launching applications, it’s able to execute them with instantaneous results. Right away, we’re averaging Quadrant scores between the 2,000 and 2,600 marks, which aren’t stellar to say the least, but more in line to being average. Naturally, with its 1.5GHz dual-core CPU, we would’ve liked it to see it obtain scores over the 3,000 mark, like the Samsung Galaxy S II, but alas, we’ll settle with it nonetheless. 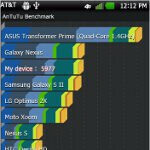 Meanwhile, it seems to fare better with the AnTutu benchmark test, seeing it spits out a total score of 5,977 – putting in line to the Samsung Galaxy Nexus in the score chart. As much as some people might be bummed with the results, especially for being the newest thing on the block, we’re not all that surprised by it. Rather, it operates decently in the short time we’ve been checking it out, but of course, we’ll be putting it through some additional testing to see how it all comes down in the end. That's why I hate rapid progress. The don't do enough to optimize hardware with software and even with dual core you can see lags. Silly! Pretty sure it has 720p display. i'm pretty sure it doesn't. don't quote me on it though. wow, and my captivate does have 720p....that is funny. The nitro has a 720p SCREEN RESOLUTION meaning 1280x720. A very high density screen. The 720p on the captivate you're talking about is most likely the camera's capability of shooting at 720p... it only has a 800x480 screen resolution. it has slow SD card read/write speeds, but good 3D, CPU and RAM scores. That's his experience, mines been nothing but smooth. I love it. THE REAL QUESTION IS it worth it to us to switch from at&t Samsung and HTC. because of LG's really bad updating history, in order for me to purchase this phone -LG will have to come out with a ICS time-frame statement as to when they will update the ice cream sandwich update NOW! i like the phone but i dont trust LG update policy. We need to know that after our purchase will LG, CARE and supply us with regular updates? or will they take the money and forget about there customer base? that's consistent with scores we should be seeing from a 1.5GHz S3. i'm surprised it held out powering a 4.5" 720p IPS display. 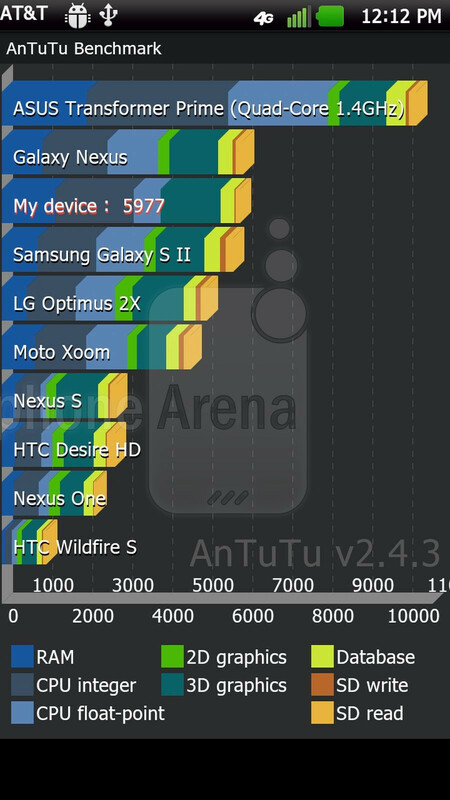 remixfa, how do you explain this thing beating the sII in antutu? link please. they compared it to the galaxy nexus, not the galaxyS2 for antutu in the article. 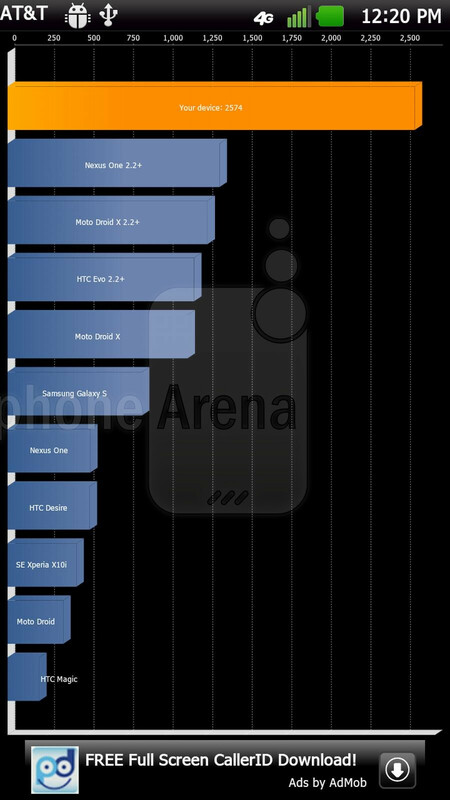 Looks like this phone slightly beat the GNxs and the GS2 on Antutu tests, and that's with a 0 for 2D graphics. 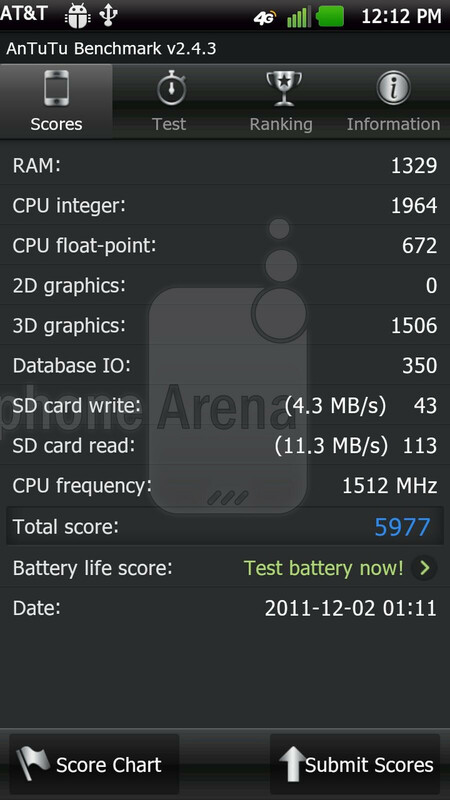 My phone, the RAZR beats the SGS2 in this benchmark - but you have to look at the categories scored. I have seen Samsung single core devices run smoother than some dual core phones. It has to do with software more than hardware. Samsung has optimized their software very well to run smoothly. While Sense is a power hog and LG seems no different. Why'd they even expect this to beat GS2 on quadrant? GS2 comes with a crappy WVGA resolution and quadrant is an even crappier benchmark app. Quadrant seems more and more unreliable... My bro Evo 3D only runs 1800 +/-... Are you kidding that a 1.2Ghz duo corer only runs that low? i dont believe, and i believe that Nitro 3D can do more than that... a lot more than that. the EVO 3D averages around 2000. the scores you see here for the Nitro are around the best a 1.5GHz S3 can achieve and it's probably a little easier for the Nitro to achieve because of it's lighter interface. i'd say the very best the 1.2GHz S3 in your EVO 3D can achieve is like 2200-2300.